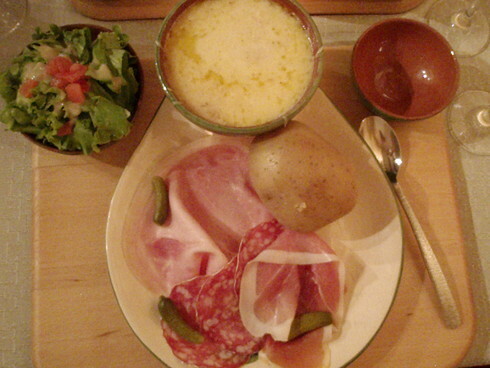 This is a hardy dish to serve to a group of really hungry people – perhaps after a day of skiing in the wintertime. I first tried it on a trip to the French Alps where I was doing some research on the cheeses of the area. It pairs well with a dry white wine. Rub each ramekin with 2 halves of garlic cloves. Add slices of Abondance cheese to about half way up the sides of the ramekins. Sprinkle with cracked pepper and add several drops of wine. Heat in the oven until the cheese is very bubbly – about 10 minutes. Serve with boiled potatoes, bread, ham, pickles and a side salad.